ABC Bingo offers up a great range of bingo games, that's both perfect for beginners and experts alike! ABC Bingo is the perfect introduction to anyone starting out in the world of online bingo. Everything about ABC Bingo's design has been selected on making the process of playing online bingo as simple as possible. From the moment you sign in, to the moment you call your first bingo, you'll never find yourself fighting against the clear user friendly features and clean design offered by ABC Bingo. It's an online bingo site simple enough for beginners, with the depth that'll satisfy experts of the game as well. The Dragonfish network has produced some stellar bingo sites in the past, acting as the backbone for hundreds of online bingo sites. ABC Bingo is among the top of that pile, offering an online bingo experience that is suitable for any skill level, from bingo beginners, to veterans of the game. ABC Bingo isn't just a great bingo site because it's inclusive. ABC Bingo gets off to a great start with its clear design and charming art style, before pulling players even further in with its incredible welcome bonus. Once you're through the door and all signed up, that's when you get to enjoy ABC Bingo's variety of bingo games, as well as an additional library of slot games, which should give any player a reason to stick around. When it comes to bingo games, ABC Bingo has a clean offering of bingo rooms which delivers exactly what new players are looking for. Players can enjoy 90 ball bingo, 75 ball bingo and 5 line bingo. This gives players two traditional bingo game types and an unusual version which players may not have tried out before, which is much like what other bingo sites have to offer. ABC Bingo has games taking place in a constant cycle, so players won't be waiting longer than around 30 seconds before they're playing once again. 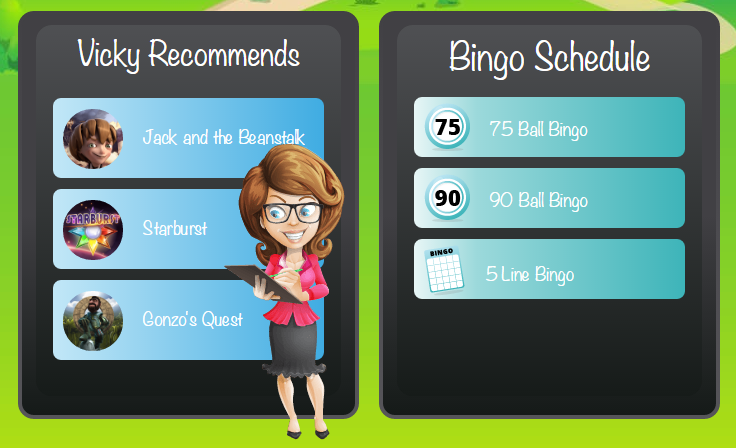 Once in the bingo lobby, players will find games which have a user friendly look that they can play easily across any of their devices, clear instructions for new players and even an in game live chat to help anyone out if they're well and truly stuck. ABC Bingo also offers a healthy slot and casino table range of games. Players can enjoy some innovative slots from major names like NetEnt and enjoy a few progressive jackpot slots, with the most notable being Cleopatra, which is part of IGT's Mega Jackpot range, famed for its huge progressive jackpots. Unusually, players can also play blackjack, roulette, baccarat and even a range of live casino games. This number of casino table games is very surprising for a casino of its size and should give players a great distraction from bingo if they need a short break between rounds. ABC Bingo impresses right from the get go by offering a deposit match which is far more substantial than we're used to at other bingo sites. Players can get a 400% deposit match up to £100, so if they deposit £20, they can start playing with £100 right away. The deposit match is available from a deposit as low as £10, so even players on a tighter bankroll can still enjoy ABC Bingo's welcome bonus. 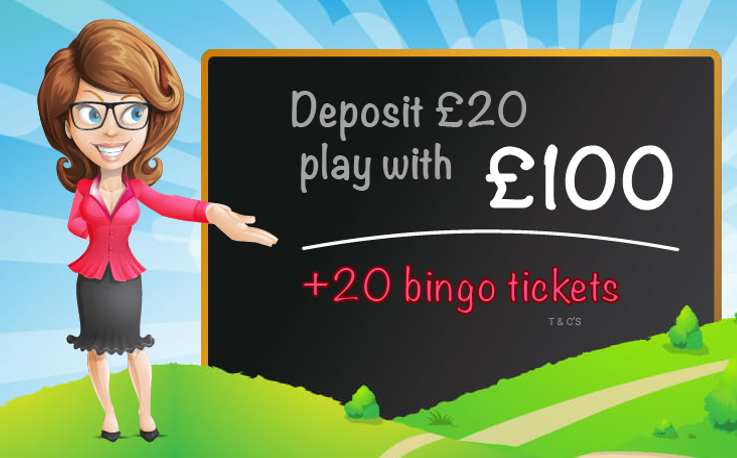 Players will also earn themselves 20 free bonus tickets as part of that welcome, so they can also enjoy 20 free games of bingo without even dipping into their welcome money. All the bonuses at ABC Bingo come with 6x wagering requirements, which are to be expected from the industry. That means that at ABC Bingo, you get a bigger welcome bonus without having to shoulder any extra cost. When it comes to regular weekly bonuses, ABC Bingo slips behind what the competition has on offer. This is disappointing as ABC Bingo starts off incredibly strong, but doesn't give the kind of promotions that will keep most players around. While it does have a rewarding cashback bonus which will give players more bonus cash than they would usually get at a bingo site, the clear lack of tournaments and extra spin giveaways may pose a problem for most players. Players can look forward to that cashback bonus, which offers players 10% cashback on any of their losses during the week. The rest of their promotions focus on prize giveaways, which includes a spa day every three months for anyone who refers a friend, as well as free school equipment for a year for lucky players who get selected from ABC Bingo's raffle. These giveaways are still generous, but they might not appeal to every player. Players can still take part in the progressive jackpot and big jackpot games which happen throughout the week at ABC Bingo, if they want a chance to win some more cash and make up for the lack of additional promotions. Players who want to make a deposit at ABC Bingo aren't going to have a problem, since ABC Bingo offers a diverse range of depositing methods to get you up and running. Players can use any of the following deposit methods at ABC Bingo: Credit / Debit cards, Paysafecard, PayPal, Neteller and Entropay. The minimum deposits are also kept nice as low, with players able to deposit from as low as £5, although players must deposit at least £30 before they are able to withdraw any winnings, so the low cost of depositing is slightly misleading. When it comes to withdrawal, things are less impressive. Although ABC Bingo does nothing much worse than the rest of the industry, its payout speeds are still on the slower end of the spectrum. Payouts take any time from 5 – 7 days, which is just the bingo site's own processing times, meaning that payouts can potentially be longer. Players can withdraw from as little as £20, and are thankfully not restricted by which method they can withdraw with, where withdrawal is an option. ABC Bingo makes it easier than ever to contact its customer services department. Their philosophy is as simple as ABC, with the intention of getting new bingo players up and started as soon as possible. Players can contact customer services through traditional means such as a freephone telephone number or an on site email contact form. However, if players are in the middle of a game, they can also request live help at any time, so wherever you are, you're never stuck for help at ABC Bingo. Want to play at ABC Bingo? ABC Bingo is a modern online bingo site which delivers the best that bingo has to offer! Earn A £100 Deposit Match! ABC Bingo ABC Bingo is a smartly designed mobile bingo site which is the perfect diving off point for anyone who has never tried online bingo before. It's got user friendly games, a clear user interface and a selection of games which will keep any bingo fan entertained for hours. ABC Bingo slips up when it comes to a lackluster selection of promotions, but it packs more than enough of a punch to remain a bingo site worthy of your time. PreviousWhich Operating System Is Better For Mobile Gambling — Android Or iOS?